A cheeky squirrel in Alberta's Banff National Park has gone viral after stealing the spotlight in a tourist's photo. Melissa Brandts, who was visiting from Minnesota, had set up her camera on a tripod to capture her and her husband, Jackson, in front of picturesque Lake Minnewanka in May. "We had our camera set up on some rocks and were getting ready to take the picture when this curious little ground squirrel appeared, became intrigued with the sound of the focusing camera and popped right into our shot!" she wrote. The ground squirrel became the focus of the picture as the couple faded into the background. Jackson Brandts took a few more shots using a remote-control shutter. "A once in a lifetime moment! We were laughing about this little guy for days!" wrote his wife. The couple submitted the photo to a National Geographic contest. The magazine posted it to an online gallery on Aug. 7. In less than a week, the Crasher Squirrel, as it's become known, has stormed the internet. Photoshop enthusiasts have added the furry scene-stealer to family portraits, famous paintings, and even to the top of the Queen's hat with a pile of nuts. Back at Lake Minnewanka on Thursday, the squirrels continued to charm and confound visitors. 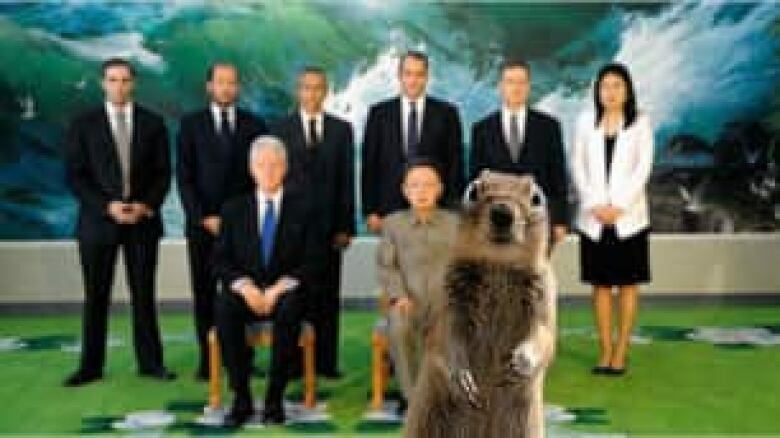 Check out adaptations of the Brandts photo, or share your own version of the Crasher Squirrel via BuzzFeed. "They are a nice colouring and they come right up to you. They are pretty friendly," said Dean Hartey, visiting from Edmonton. But Australian tourist Ron Sinclair said all he has are blurry pictures of the ground because the Columbian ground squirrels won't stay still. "We got lots of photos of rocks," he said. 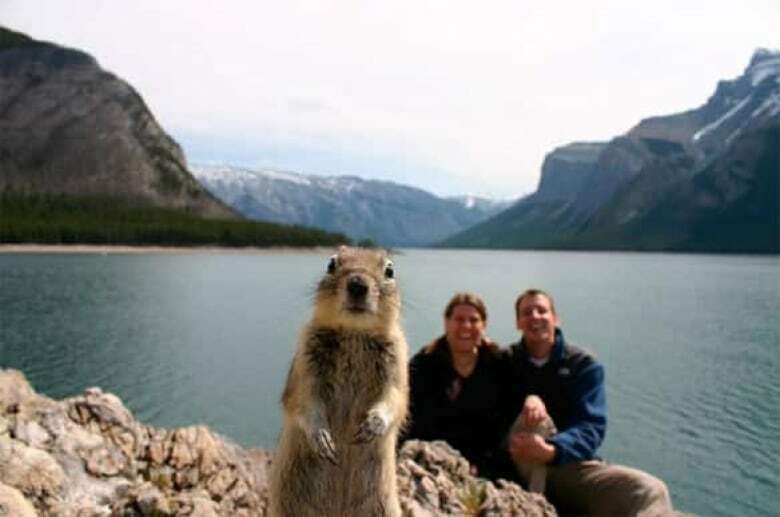 Tourism officials are delighted with the buzz created by the Crasher Squirrel at a time when the number of international visitors to Banff has slumped. "The Canadian tourism industry as a whole has certainly been facing unprecedented challenges so the welcome addition of the Columbian ground squirrel as Banff ambassador is good news," said Julie Canning, president and CEO of Banff Lake Louise Tourism.